Well congratulations to our guys! 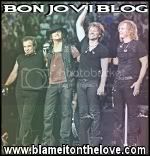 They won the 2011 Fan' Choice award for "Best Tour of the year" at the eventfull contest!! The Best are yet to come! Keep on Rocking Guys! !